Restorations Unlimited Inc. has been providing furniture restoration in Northern Virginia, Washington DC & Maryland since 1973, including Loudoun County and Fairfax County. If you’re ready to go first class and you have a family heirloom that you would love be restored or preserved to be handed down, we are ready to help because those are the jobs we love doing. We are not strippers nor are we a Mister Fix-It. 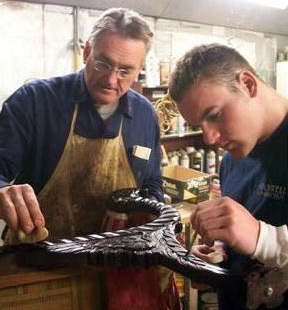 We are a small family of artisans and craftsmen who take the same time and attention to restore and preserve your family treasures as we would our own. We take pride in providing the highest quality restoration of fine furniture, pianos, antiques, works or art, family heirlooms and cabinetry refinishing/woodwork. Special attention to customer satisfaction has always been our highest priority. We are ready to take on all of your restoration and repair projects – even the ones you think are not repairable. Call 703-904-9575 or email us today and let us take a look! Contact us at 301-758-3322 for our Maryland drop off location. I cried with joy when I picked up my mother’s chair and it looked just as it did when I was a child. I am thrilled that Bill at Restorations Unlimited not only salvaged, but restored an intricately carved table. It’s become the conversation piece at my parties.